This morning OpenSignal have published a new “State of LTE” report. You can find their February one here but today the report, which focuses on the speed and availability of 4G networks around the world, gives us a number of highlights. First, the fastest 4G countries in the world now have download speeds greater than 30 Mbps. Here in the UK we’re seeing an average of 21.16 Mbps on 4G, which compares to 13.03 Mbps in Trumpton (sorry, I promise to only do that once) and 34.94 Mbps in New Zealand. The two fastest, Singapore and South Korea, average greater than 45 Mbps. Coverage though, that’s still a problem. 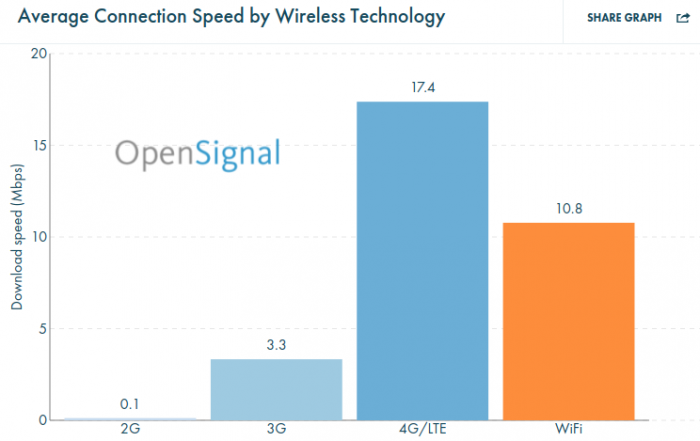 4G has been kicking around for many years now but it still hasn’t gained the reach of 3G. Trumpton (OK, just one more time) and Western Europe seem to be failing in a couple of aspects. In the United States of Trump they still have 4G speeds which are below the global average. Meanwhile, over here in Brexit-land and Europe, we seem to have trouble delivering a 4G connection which is consistent. Get more information on the OpenSignal website.